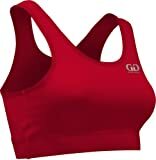 The Game Gear Women’s Aerobic Sports Bra provides the comfort and support needed for exercising. Made from a 4-way stretch, moisture management bright yarn, this Game Gear essential will surpass expectations. Great as underclothing for any activity or sport.